The 23-year-old German wins the second tournament of the Istarska Rivijera clay-court swing in Croatia. 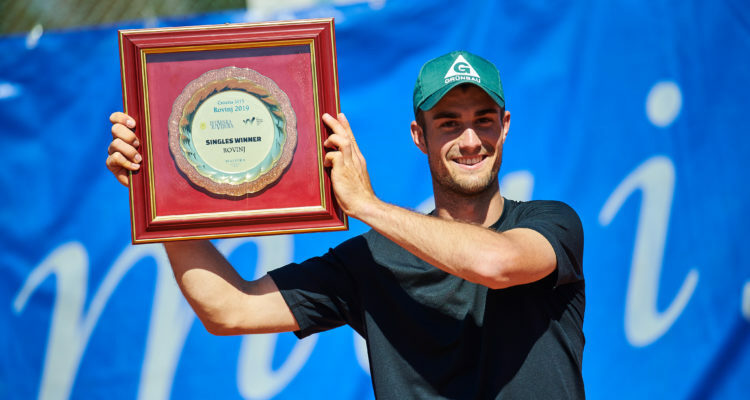 Constantin Schmitz capped a dream week at the Istarska Rivijera with his first singles title on the ITF World Tennis Tour. The 23-year-old German defeated Jeroen Vanneste of Belgium 6-2, 6-4 in Sunday’s final at the Sports Center Eden in Rovinj. Wild card entry Schmitz, who only dropped one set en route to the title match with wins over Hungarian qualifier Gabor Borsos, Pavel Nejedly from the Czech Republic, Petr Nagy from Hungary and Italian Luca Giacomini, was in control of the final. The former college player and two-time ITA All-American as well as Tulane University Male Student-Athlete of the Year 2017-18 broke Vanneste’s serve six times to seal victory in one hour and 21 minutes. “The final was great, just like the entire tournament week. We had great conditions, a nice club, and fantastic organization. I was feeling very welcome and with a familiar environment,” said Schmitz, who learned only on Sunday before the tournament that he will get into the main draw of the $15,000 clay-court event. By lifting his first ITF singles trophy, Schmitz earned $2,160 in prize money as well as 100 ITF Ranking points. At last week’s tournament in Porec, Schmitz took the doubles title alongside his practice partner Benjamin Hassan. This entry was posted in ITF World Tennis Tour, ITF World Tennis Tour News and tagged Constantin Schmitz, ITF World Tennis Tour, Rovinj.